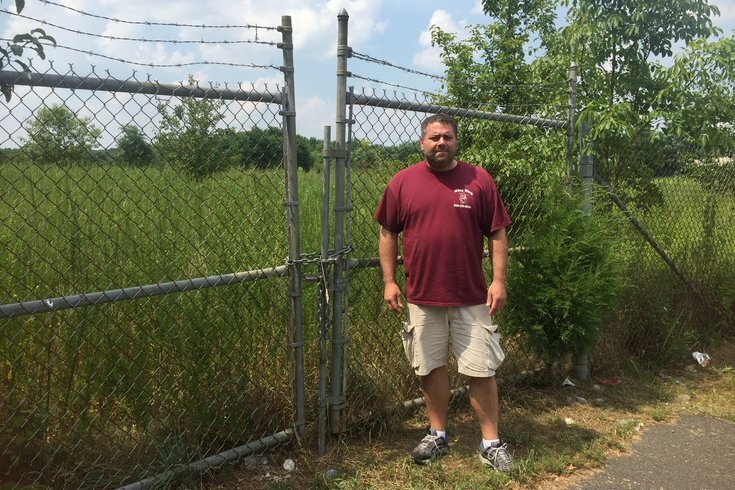 Mike Babcock, a Moorestown business owner and resident, at the padlocked entrance to a former pesticide plant not far from the town's wellfield on North Church Street. Babcock believes the Superfund site is a likely source of contamination in the public water supply. A water analyst associated with environmental activist Erin Brokovich has preliminarily told Babcock there several possible sources for the pollutants. Moorestown has an expensive problem: contaminated drinking water has cost the municipality more than $5.5 million in the past two years, according to a township official. A local water activist says that cost is at least $1 million higher. In either case, the meter is still running. Which is why the township is looking for outside professionals to recover its expenditures. Among the prospective bidders are a law firm and water consultant aligned with clean water activist Erin Brockovich. She's famous for a movie of the same name – and her depiction by Oscar-winning actress Julia Roberts – about her obsessive legal efforts to hold a California utility responsible for contaminating a town's drinking water. The befoulment of Moorestown's water is especially ironic since the town of about 20,000 was founded because two springs there provided reliable drinking water to colonial settlers . The affluent New Jersey town, home to many Philly sports team members and the largest private residence in New Jersey, has spent millions since the 2013 discovery of trichloropropane 1,2,3 (TCP 123) and trichloroethylene (TCE) in its water supply. TCP 123 is considered a carcinogen by California, but not federal, health standards. According to the Agency for Toxic Substances and Disease Registry, TCE is a known human carcinogen. Initial action by the township was slow, with its two wells eventually closed and re-tested. One well, the deeper one, was re-opened intermittently until test results again forced its closure. Both wells were finally turned off for good in early 2016. "They didn't want to deal with it," said Moorestown businessman and water activist Michael Babcock of the group Moorestown Water. The township has shown no real interest to date in tracking down the causes of the pollution, he said. By his estimation, the township has actually spent $6.5 million to provide drinking water to affected homeowners since the issue came to light in 2014. 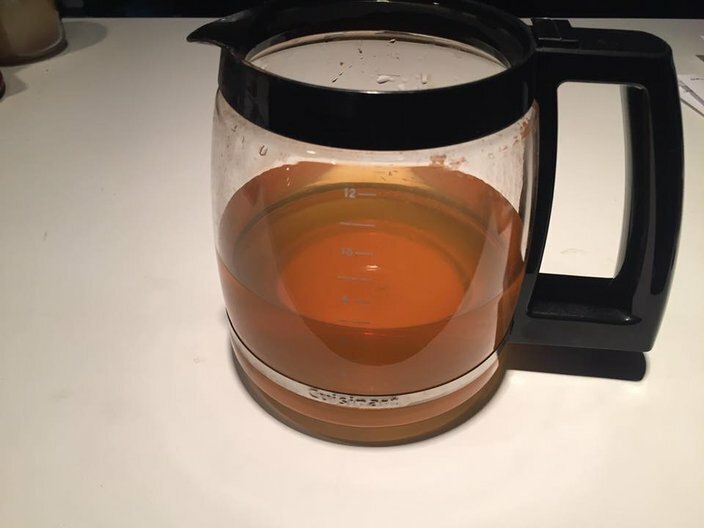 During a budget presentation in March, township manager Thomas Merchel put the estimated cost of buying safe water at $4 million this fiscal year, Babcock said. Water purchases in 2015 and 2016 for the 6,629 homeowners hooked into the public water supply have run to $3.5 million, according to Merchel. And an interim filtering system – costing $2 million, according to Merchel – was installed. But a complete solution with more safeguards – filtering TCP, TCE, radiologicals which can come from natural radon as well as pollution, and 1,4 Dioxane, a chemical stabilizer which can cause neurological issues – will add many more millions to the final costs. Merchel did not provide a cost figure, but Babcock said the early preliminary estimate by the township was $7 million. Without its own safe water supply, Moorestown is buying a minimum of 327 million gallons of drinking water annually, piped to residents at a cost of $2.2 million, said Merchel. Now the township plans to seek legal assistance and hopes to recoup its costs. Though not a sure thing, Brockovich and her professional allies could be hired to go after the polluters. Moorestown agreed in early July to put out a request for quotes, seeking a law firm to identify polluters and pursue legal actions against them. But the township has yet to formalize that document. Once it does, bidders will have a month to submit offers to the township. The submissions are likely to include one from a law firm aligned with Brockovich says her water consultant. A committee – still not formed – will select from among the proposals. Moorestown Water wants a seat on the selection panel. Water is an issue in Moorestown. Taps often run brown water. Worse, the water supply is tainted with trichloroethylene, which is considered a human carcinogen. 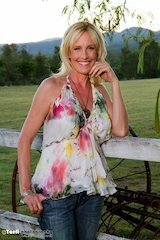 Brockovich has worked with the Weitz and Luxenberg law firm for nearly a decade. The firm, which has a specialty in environmental law cases and mass litigation and class action lawsuits, happens to have a New Jersey office in nearby Cherry Hill. Brockovich’s water consultant, Bob Bowcock, of Integrated Resource Management in California, has been researching Moorestown since last November. Bowcock’s involvement came after Brockovich was contacted by members of Moorestown Water, a Facebook group. Merchel, who became town manager earlier this year following the abrupt departure of his predecessor, said he has had “no interactions” with the group. Moorestown Water at one time said Brockovich had planned to visit the township to publicly speak about water issues. But a personal visit appears to be off-the-table for now; Brockovich did not respond to requests for comment, though Bowcock, her water analyst, has spoken with PhillyVoice. Bowcock said Brockovich and her allies plan to submit a quote to represent Moorestown in seeking compensation for its costs. “I am happy to see there is significant progress in Moorestown, New Jersey concerning solutions for cleaner/safer drinking water for the community. The Township Council has identified many of the issues concerning groundwater contamination, treatment options and distribution system infrastructure. Bowcock, who has visited Moorestown to observe first-hand, told PhillyVoice that his preliminary investigations have identified "five to seven" sources for the town's drinking water contamination. While declining to name the possible culprits, he said he visited the various sites which may have fouled the drinking water. The state has identified at least 23 known sites in Moorestown with contamination issues. And while local water activists, such as Moorestown Water's Babcock and businessman James Mullin are frustrated with the pace, Babcock said Moorestown is actually moving faster than average. Babcock believes a pesticide plant, closed decades ago, is one likely culprit. Classed as a federal Superfund site, the dormant fenced-in site sits just across the street from the town's wells on North Church Street. And he points out that the plant is also close to nearby Maple Shade's wells. Mullin said he's several times tried unsuccessfully to get the attention of local officials about a defense contractor site on Borton Road. The site was formerly occupied by GE, then RCA, and is now Lockheed Martin. There are environmental reports about the discharge of industrial degreasers on the site. TCE is one such solvent.